“There’s nothing for us here. We should turn back,” Warden Bradan urged with apprehension as the grove grew dark with the sinking sun. “There is always something to find, and we have found nothing yet. Our work here isn’t done.” Warden Faelan turned in his saddle to address his companion. “Is there something about the dark that unmans you?” he said with a slight smirk. Warden Bradan did not rise to the bait. It had been thirty years since his naming day, and ascension to the Wardens of Dal Riata. On his first ranging he had been a green boy, jumping at the sight of his own shadow. Now, as a man and seasoned veteran, he knew how to interpret the signs that the earth was speaking. It had been twenty years since he had first been assigned to Stonevale, once a lush and verdant place, had now begun to turn barren and arid. The earth was speaking, yet it had become a stranger to him. There were ill forces at work here, and this is why he called for reinforcements on this ranging. “We have a long ride ahead of us back to the farm, and night is falling. There is no use continuing this tonight.” Bradan looked to the horizon where only a sliver of sunlight peeked over the top of stony mountains, turning the clouds purple as a bruise. Warden Caomh knew this was going to happen sooner or later. Caomh marked the distance that they had travelled on the trip to Stonevale from Lir’s Reach by the periodic complaints of Warden Faelan. Faelan was ranked high as a Warden, and so had command over this expedition. However he was not ranked so high that he could refuse the Council of Wardens when they accepted Bradan’s request for help on this ranging. Being more accustomed to his offices in Castle Mac Lir and his assignment as a liaison to the king, Faelan has protested fiercely against leaving the temperate climate of Lir’s Reach to make this trip to barren Stonevale to assist what he considered to be a pig farmer. “The shadows are growing long. I’m not sure how we hope to find anything in the dark.” Warden Caomh replied tentatively, hoping to not raise the ire of his superior. Fuming, Warden Bradan trudged silently behind Faelan. The dark frown on his face and the way he gripped his spear as if to strangle the life out of it belied his silence. There was something different about tonight that set him on edge; something that made the hair rise on the back of his neck. The shadows seemed longer and darker, and the birds that normally sang sweetly in the trees seemed to mock the travelers with their calls. Caomh sensed a tension in Bradan that should not exist for an experienced Warden. An owl hooted mournfully in the distance as the trio entered the Western area of Stonevale, a fertile expanse of land known by the locals as Garden Grove. As they trudged forward through the thick grass, Caomh shivered at the sudden cool breeze that swirled around them. Bradan was right, there was something wrong about this darkness, but Caomh could not pinpoint what it was. This wasn’t a feeling that you would want to share with your commander, especially a commander like Warden Faelan. Years ago Faelan had made a name for himself, fighting the Connacht invasion of Shalemont Ravine. It was due to his efforts as a skilled commander that the forces of Queen Medb did not overrun the MacCroin encampment which guarded the entrance to Lirs’ Reach. As a commendation for his bravery, he was awarded the post in Castle Mac Lir as liaison to the king. Since that time, he had grown accustomed to the life of privilege that was afforded to residents of the castle. Where he once could read the signs that the earth was showing him, he walled himself away from the earth behind blocks of granite and became a stranger. “You should have dressed more warmly for this expedition.” Faelan rolled his eyes. “I would think that the two of you would know by now how cold the nights get here. Gods, I would have done better bringing my niece with me. At least she has the good sense to keep her mouth shut.” Faelan slid from the saddle of his steed with a flourish, and tied the reins to a nearby branch suspiciously devoid of leaves. Together, the party silently mounted the ridge to Garden Grove as the sun slipped below the horizon, leaving the world in darkness. As they made their way forward, the green grass became sparse, and turned to brown dirt that was picked up and buffeted them by the now lashing winds coming from the West end of the grove. Trees that were green and leafy had lost their foliage, and died in the earth in which they once flourished. His jaw set in determination, Faelan marched forward, as his companions surveyed the landscape in wonder. What had caused such destruction? “Stop!” Bradan hissed in a whisper, as he put his hand on Faelan’s arm. Faelan looked at the hand disdainfully and shook his arm from Faelan’s grasp. In front of the party, just beyond a massive lifeless oak tree, a light shone in the grove. The trio crept forward, being careful not to make a sound in their advance. As they reached the tree, they dropped to their bellies in hiding to get a closer look at the source of the light. Torches illuminated the barren ground at the far end of the grove, and numerous men moved back and forth, carrying massive stones to the steep hill that marked the end of Garden Grove. There in the distance, Caomh could see the construction of a ramp up to a platform at the hilltop, upon which an unfinished stone ring sat. There was something unnatural about the way the men moved. It was almost as if they were in a dream-like state, and that they did not know what they were doing. In the middle of the throng, stood a tall man dressed in the deepest black robes, marked with red trim. His eyes glowed red in the firelight, as he surveyed the scene with a pleased look on his face. If the actions of these men were not their own, surely this man in black was to blame. Squinting, Warden Caomh squinted and stared to try and get a better look at the man’s face. It seemed strangely familiar. Suddenly the flames of the torches guttered and winked out, leaving the grove in darkness for seconds, only to roar to life again within moments. When the light returned, the men were gone. Only the platform with the unfinished stone ring was left to mark their passage. “Let’s go have a look.” said Warden Faelan as he rose from his hiding place. Faelan strode to Bradan and grabbed him with both hands by the front of his shirt and pulled him close. “Listen to me. I will not have this expedition be a failure because of a few nervous cowards. We will move forward and scout the area. The people have gone, so I see no reason to delay any further.” Faelan roughly let go of Bradan’s shirt and turned on his heel, hand on the hilt of his sword. The Wardens followed him anxiously, searching for signs of danger. They strode to the foot of the platform’s ramp, and stared up at the massive stone construction. Before they could ponder the structure‘s purpose, the torches began to wink out one by one. “Go!” Warden Bradan yelled as he drew his bow and fired wildly into the darkness. Faelan drew his sword in challenge to any attack that would come his way. As the torches died around Warden Faelan, Caomh could hear his anguished screams as he was beset by some unseen force. Caomh turned quickly and ran from the grove, stumbling over rock and branch as he tore through the grove back to safety, with Warden Faelan following behind with his greatsword in hand. Caomh lost sight of Faelan as he ran when Faelan stopped to face an unseen danger. Faelan could feel it now. The darkness was closing in on him tightly as he ran. It was as if something was choking off all light and hope in the world, and that the only option was despair and fear. Faolan stopped in his tracks, sword drawn. He did not know where he was anymore. The grove looked unfamiliar to him. Was he headed in the right direction? “Show yourself!” Faelan cried out in fear, wheeling around to find his adversary. The shadows surrounding Faelan crept away, and pooled in one area, slowly taking the shape of a man. The Chaos Wraith made no sound. Faelan bellowed as he swung his greatsword at the apparition, catching it squarely in the chest with the honed edge. Any normal man would have been felled by such a blow, but normal weapons did not seem to affect this adversary. Slowly, it advanced. Faelan slashed and stabbed at the shadowy form before him, to no avail. The Chaos Wraith advanced silently, as Faelan pressed his attack. Camomh could hear Faelan’s shouts, and the clang of steel in the distance as he ran hell-bent back to where Faelan’s horse was tethered. Then there was silence. The grass underfoot was starting to come back onto the trail, and Caomh knew he was almost there. His breath burned in his chest as he ran, and he tried to leave the thoughts of his companions behind him in the shadows. Just a bit further and Caomh could see the mount, and his passage to safety. A hooded man in black robes was standing in his path, and Caomh skidded to a halt. Upon closer inspection, the man was not standing, but rather floated, as he had no legs. Where his hands should have been were black claw-like fingers the length of his arm, that were tipped with blood red points. But it was the eyes that froze him to the spot. Under his hood, Caomh could not discern any features of the wraith, only glowing red eyes; eyes that burned with hatred for the living. The floating phantom advanced on Caomh, and the chains hanging at his side jingled slightly to mark his passage. Caomh dropped to his knees, tears streaming down his face in fear. The Chaos Wraith came closer, and darkness filled Warden Caomh’s vision. And suddenly, he was gone. His knuckles went white as he gripped his weapon, and pointed it at his adversaries in a soldier’s stance. Blue eyes blazing and focused, he recalled the vow that he made upon taking up his sacred quest. None shall pass while the guardian of Farcrag Castle is wielding the magical sword given to him by the tree spirits of the Otherworld. Jowan smiled as he and Davian passed the boy of five years old brandishing a stick snapped from a tree, and paused to hold his hands in the air with a smirk as he played at being afraid. Another boy of a similar age, with a mop of mouse brown hair ran up from behind and grabbed the boy by the shoulder. The boy took one last look at the pair of Wardens, and satisfied that his opponents were sufficiently frightened he wiped his nose on his sleeve, and the boys ran off together into the milling crowd. The Beltane celebrations were beginning in Lir’s Reach, with multicolored garlands of spring flowers strung from the balconies of the buildings and adorning the castle walls. Farcrag Castle was resplendent in bright banners and the clan crest of King Mac Elmoore. The air was filled with the smell of flowers and baked goods cooling on the many windowsills, set there by the house’s goodwife. 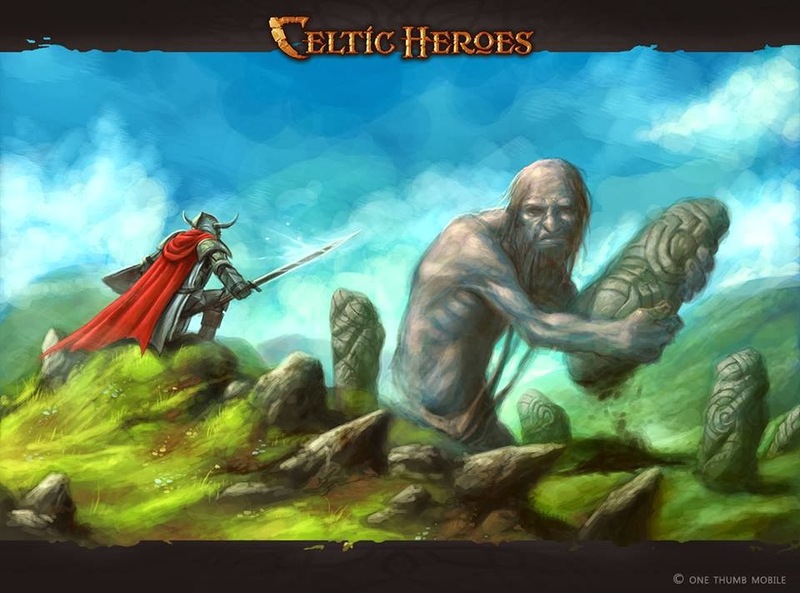 As with every Beltane celebration, the festival was commencing with the weeklong anniversary event commemorating the founding of Farcrag Castle, and the victory of the Celts over the fearsome Firbolg. Although the Firbolg have not been seen in Lir’s Reach in thousands of years, tales of the Firbolg continue to frighten small children during the long festival nights as they gather around the bonfires. Any grown man knows that the Firbolg were driven underground centuries ago, and do not exist anymore. The Firbolg only exist in tales used to frighten children; real men have learned to stop fearing the Firbolg. “This is going to be the best Beltane celebration yet!” Jowan exclaimed. He had been a Warden for two years now, honing his abilities in the arena against captive Pict gladiators. The Picts were a savage race from across the sea. From time to time, they would make raids upon the Celts in Lir’s Reach. The Wardens of Dal Riata would always put down these raiding parties without a problem. As a penalty, these raiders would face a choice: the dungeons or the arena. As a race accustomed to violence, there was never really a choice. The Wardens always had an ample supply of gladiators to practice their skills on. Davian scanned the crowd uneasily. Ever since his rescue mission in the twisted tunnels two years ago, he could not shake the disquiet in his heart. How could he ever relax his guard when enemies could leap from the shadows at any moment? But furthermore, how could the Council of Wardens, the people who govern the Wardens, have forbid him from rescuing his friend? How could they have not found the threat when it was so clearly in front of them? Since that day, the Blackstone Cabal was not seen again in Lir’s Reach. The Council sent scouts to search for the whereabouts of their camp, but all efforts to find it had turned up empty. They never did uncover the secret caves in the Twisted Tunnels where they had held Jowan captive. “Do you ever think they will come back?” Davian asked his friend as they walked the streets of Farcrag Castle. The hustle and bustle of the crowd parted around them as they walked. Everyone knew to give Wardens the proper deference, and Davian and Jowan were dressed in their full Warden regalia for the coming festivities. But before the feast and the competitions, King Angus Mac Elmoore would always give a speech to begin the celebration, and this year would be no different. All the citizens of Lir’s Reach would be in attendance, packing the courtyard, to hear the opening of the festival. Jowan knew who Davian was talking about. He knew that the Blackstone Cabal burned in Davian’s mind, stuck there like a burr under a saddle. Truth be told, Jowan could not shake the burning eyes of the man in black from his memory. Being held captive was the most terrifying experience that he had ever had. Despite that, he had put on a brave face for his friend who blamed himself for entire occurrence. Because of that, they never spoke much of what happened, and Jowan never knew what had happened to Davian in the tunnels before the rescue, though it had clearly shaken him to his core. Jowan had never pushed him to talk about it, just as he would not do now. “Aye, they might. But we beat ‘em once and we’ll do it again. And this time we have all the Wardens to back us up,” Jowan reassured his friend. “Now why would you ever think that? There’s no way that they would dare to come back. Not after last time.” A series of explosions sounded, and the pair of Wardens wheeled around to see the flames, then sparkles and smoke. Putting their weapons away, the pair exchanged a sheepish glance as they realized it was only children setting off festival crackers in the street. A middle-aged woman in an apron covered in flour barged into the group of kids, and hauled one off by the ear as the others scrambled away to the alleys to escape punishment. “And what did you find in those dusty old books that I didn’t find in the arena? I’ll tell you how we can be ready for them,” Jowan boasted patting his bow. Jowan stopped in his tracks. “If that’s true, then we need to tell Warden Aramiss! We need to stop them!” Davian exclaimed grabbing Davian by one shoulder. “I have told Warden Madoc about my suspicions. I’m sure that he spoke to Aramiss about it,” Davian replied, leaving the title of Warden conspicuously off of Aramiss’ name. Davian had never forgiven the leader of the Council for the slights he received two years ago.